We’re not too sure when this will end up as an Olympics event, but in any case, it is always better to be prepared, no? 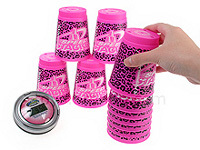 That’s what the Sports Stacking Set with Practice Timer is all about as its name suggests, it will allow you to stack up and down a dozen specially designed cups in pre-determined sequences as fast as humanly possible, where you will do your utmost to beat your previous best mark. Alternatively, you can always give this a go with the rest of your mates especially during one of those drunken outings, to see who is the fastest (while the loser drinks even more booze to decrease his/her chances of winning). Retailing for $25.90 a pop, you can always bring this home by telling the missus that you need it to improve your hand-eye co-ordination. Hopefully she’ll buy that idea.